Under stress, the prefrontal cortex of the brain disables itself. Transcending re-activates it. The experience of Transcending is one of increasing inner peace and emotional calm. The more we experience this state, the more the brain will habituate to this experience with consequent improvements in emotional stability. However, this mechanism was not designed for situations of chronic stress. If people are continuously subjected to stress, then the pre-frontal cortex becomes increasingly disabled. It has been known for a long time that emotional instability is linked to stress, but researchers are now able to provide a clear scientific explanation for this. Stress causes the frontal part of our brain, the part of our brain that is responsible for our emotional stability, to disable itself – for more detail on how stress affects the brain, see Impulsivity. Chronic stress can cause the amygdala, that part of the brain that governs fear, anger, etc. to get locked in “on” position. Transcending is a situation in which the body enters into a deep state of rest, allowing the body to remove even our deepest tensions, and causing the frontal brain to become more active. 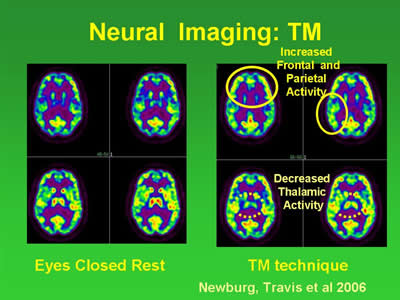 This can be measured, for example via neural imaging scans which measure blood flow to the brain. The activity in the thalamus, which relates to bodily functions, reduces, indicating a state of relaxation, while activity in the frontal cortex increases.